The Web Application Penetration Testing training course version 3 (WAPTv3) is the best way to learn how to test web apps for vulnerabilities. Being integrated with Hera Lab, WAPTv3 offers an unmatched practical learning experience. Be the first to know all the details, register for the launch webinar. All webinar attendees are in for a treat! 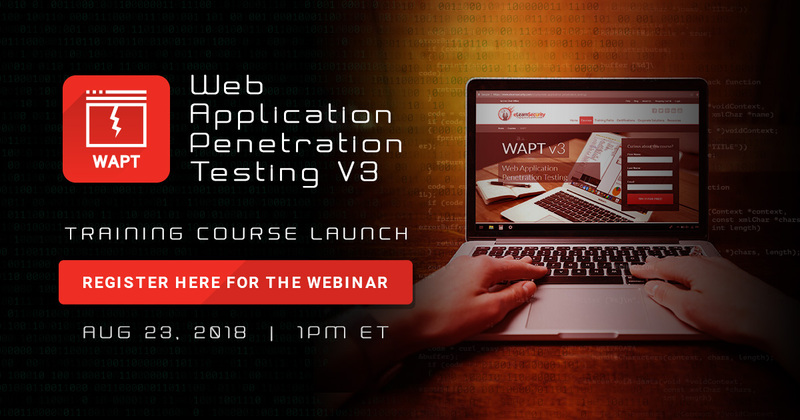 Join us on August 23 for the launch of WAPTv3 to discover the complete syllabus, take part in an exciting live demonstration, and get a chance to win this professional web app pentesting course. During the launch webinar, two lucky attendees will be randomly picked to win the WAPTv3 training course in the Full or Elite Edition. Make sure to join for your chance to win! Invite your friends and colleagues, special deals and prizes are waiting for all attendees.